Flora MacDonald lived from 1722 to 5 March 1790. She is chiefly remembered as a heroine of the Jacobite cause for her part in helping Charles Edward Stuart - Bonnie Prince Charlie - "over the sea to Skye" from Benbecula in the Western Isles during his flight in the aftermath of the Battle of Culloden. The wider picture in Scotland at the time is set out in our Historical Timeline. Flora was born in the Western Isles. 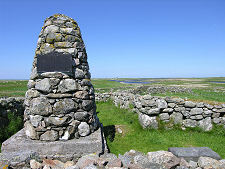 A monument on South Uist marks the place where she is traditionally believed to have been born, though there is a widely held school of thought that she was actually born in Balivanich on Benbecula. Flora was the daughter of Ranald MacDonald of Milton and his wife Marion, the daughter of Angus MacDonald. Her father died early in her life, and her mother remarried, to Hugh MacDonald. Flora was brought up by the clan chief, MacDonald of Clanranald, and was partly educated in Edinburgh. Bonnie Prince Charlie arrived in Benbecula, where Flora was living at the time, in June 1746. A companion, Captain O'Neill, sought Flora's help because her stepfather was known to be sympathetic to the Jacobite cause. After some hesitation Flora agreed to help. On 27 June 1746 Flora set sail for Skye with a permit that included herself, a manservant (Charles's companion Captain O'Neill), an Irish spinning maid, Betty Burke (Charles in disguise), and a boat's crew of six men. They landed at what is now called Prince Charles's Point, a couple of miles north of Uig on Skye's Trotternish Peninsula. From there they went overland to Portree, where arrangements had been made for Charles to travel to Raasay in the hope of being picked up by a French warship. Charles did eventually escape to France. 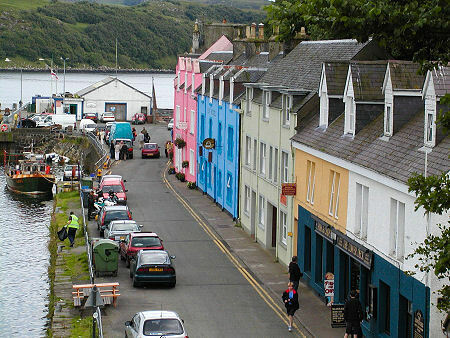 But Flora was arrested after one of the boatmen had talked about the strange maid who had travelled with them to Skye. She was imprisoned, first in Dunstaffnage Castle, then in the Tower of London, where she was allowed to live nearby "on parole". Flora's story and her courage gained her much sympathy in London and in 1747 she was allowed to go free. In 1750 Flora married Allen MacDonald of Kingsburgh. In 1773, like many other Scots, they emigrated, moving to the North Carolina Colony. During the American War of Independence Allen served with the British forces (in common with many other expatriate Scots). He was captured by revolutionaries at the Battle of Moore's Creek Bridge on 27 February 1776. Flora was exiled from the United States to Nova Scotia. As an aside, just before they left Skye in 1773, Fora and her husband were visited by Samuel Johnson and James Boswell on their tour of the Highlands and Islands. You can read Boswell's extensive account of Flora's 1746 adventures here. In 1779 Flora returned to Scotland and settled in South Uist amongst her clan. She was joined by Allan after his release in 1783 and they moved to Flodigarry, on the Trotternish Peninsula. in the Isle of Skye. Flora died on 4 March 1790, in a cottage now used as accommodation by the Flodigarry Hotel. To keep the Jacobite legend strong to the end, it is said that Flora was buried in a shroud formed of a bedsheet used by Bonnie Prince Charlie. Her funeral, at Kilmuir Graveyard on Skye, was attended by 3,000 mourners who between them, it is said, consumed 300 gallons of whisky. 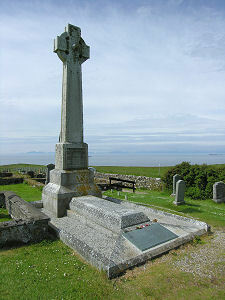 The tall cross marking her last resting was erected by public subscription in 1880 and carries an epitaph written by Samuel Johnson. This reads "Her name will be mentioned in history and if courage and fidelity be virtues, mentioned with honour."